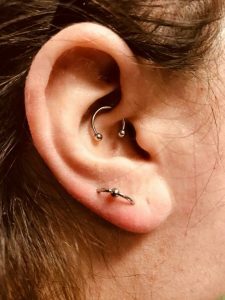 An orbital piercing is twin perforation connected by a single jewelry which usually is a ring that makes it look like an orbit hence the name. 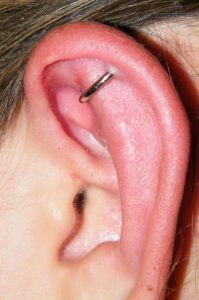 Mostly placed in the helix area of ear, this piercing can be acquired at any part of the body including the ear. 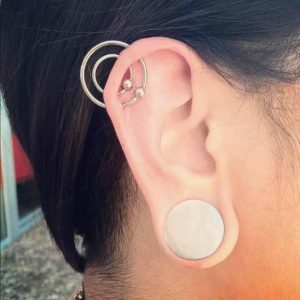 The piercing stands out from other forms due to its unique style which is fashionable giving it a stunning look. Although there is a lot of pain involved in the process, it is admirable because people love the uniqueness. Select a licensed piercing parlor. Starts by sterilizing the spot of the perforation. Mark the place of the piercing. Inject a hollow needle to remove flesh from the area. The two piercings are very near to each other, so there can be a gap between performing the piercing or they can go together at once. Insert the piece of jewelry. Clean the area of the perforation. Pain can be too much. Intensity varies from an individual to another, depending on their tolerance capacities. A significant amount of pressure is required to make the perforation so the pain rating is 6 on 10, this implies that pain could be extreme. The twinge can be suppressed using a painkiller. Healing process to an extent depends on piercer’s accuracy, and aftercare observed. 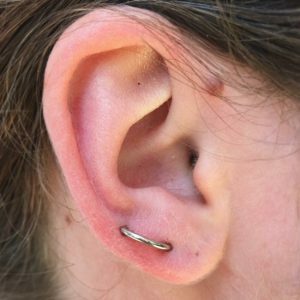 Generally, it takes around 3 to 6 weeks to mend the piercing wound entirely. Helix orbital usually takes 2 to 12 months to repair completely. Always touch the piercing with clean hands. Clean it using a piece of cotton soaked in lukewarm salt solution. Dry the surface using a soft, clean towel. Adjust sleeping position to avoid injury. Remove the jewelry till the piercing heals completely. Rub alcohol or hydrogen peroxide for cleaning your piercing. Drink alcohol or eat unhealthy food as it can deteriorate body metabolism. Seepage of red, yellow, or green fluid and it bleeds continuously. Itching and irritation for an extended period. Clean the area with a moist cotton soaked in warm saline water. Put some lubrication like Coconut oil as it is quite useful in healing. Take advice from a doctor and follow the prescription. 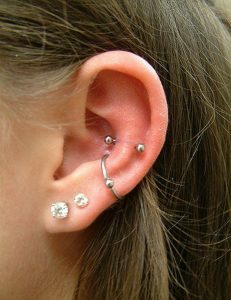 Ball piercing rings are preferable. Horseshoe rings and curved barbells are also other alternatives. 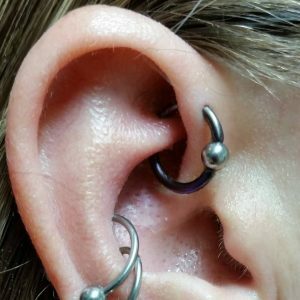 The size and thickness of the jewelry should be discussed beforehand with the piercer to avoid any later trauma. 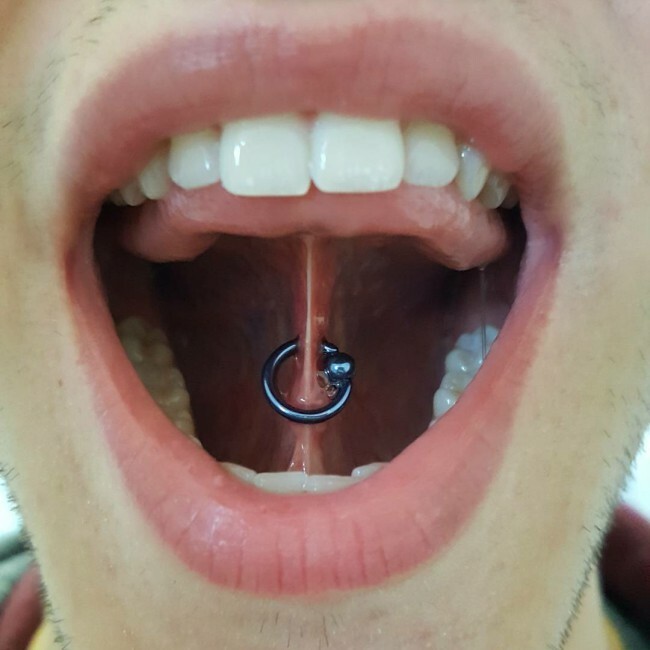 CBRs are a common choice in this type of piercing. Hoops are also available in the market. 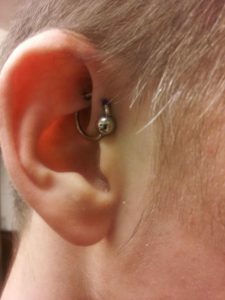 The choice should be such that it does not cause irritation or itching in the piercing area. The metal should be such which is non-reactive and non-corrosive. It will be skin friendly. Surgical Steel, Niobium, Gold, Platinum, Silver, and titanium can be ideal for the jewelry. 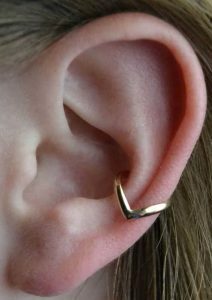 After healing the wound, other choices are also available like rose gold, gold plated steel, etc. 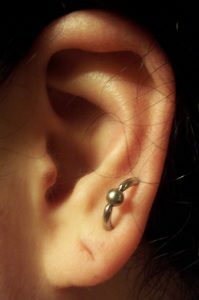 The size of the curved barbell can be 14 to 16 gauges. Initially, the size should be more as to combat swelling. Later compact jewelry can be apt. Generally, the price of this jewelry can be around $30 which can go up to $100. It depends on the choice of adornment and the piercing parlor.